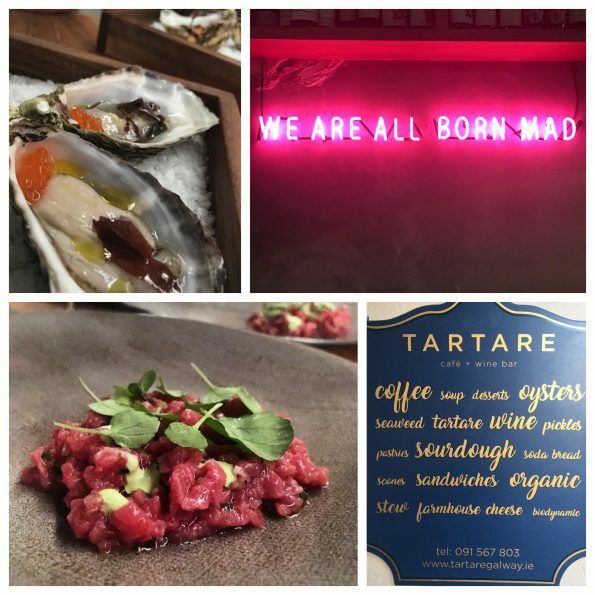 Beckett’s “We are all born mad” in fluorescent neon pink adorns the wall in Tartare, Galway’s newest venture by chef JP McMahon and Drigin Gaffey. Perhaps this is a proclamation from the pair, leaving the perceived safety nest of Massimo to set up a small café and wine bar across the road from Michelin starred Aniar that adds yet another restaurant to adorn the hallowed streets of Galway’s West End. 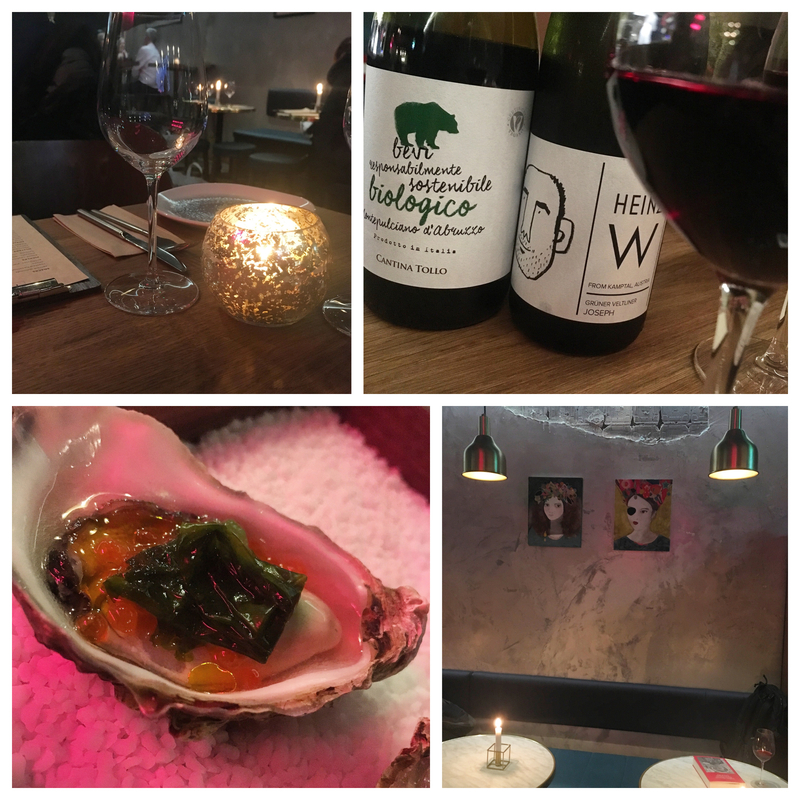 The space, formerly an internet café if memory serves correctly, has been unrecognisably transformed and plaudits must go to Drigin who has more than made the most out of what estate agents would call cosy. Smart design is much more difficult in tight spaces and a restaurant has been created here that feels intimate yet atmospheric, elegant but with an edge. There are elements of chic Paris café with marble topped tables that contrast yet somehow seamlessly marry with concrete, navies, greys, parquet wooden flooring, clever lighting and interesting art. It is quite definitely on the right and correct side of hipster wanker and I am behoved. We are all born mad, some remain so. So what is going on here? A café by day and when the sun goes down and the lights dim the space transitions into a sophisticated wine bar serving small plates and natural wines. 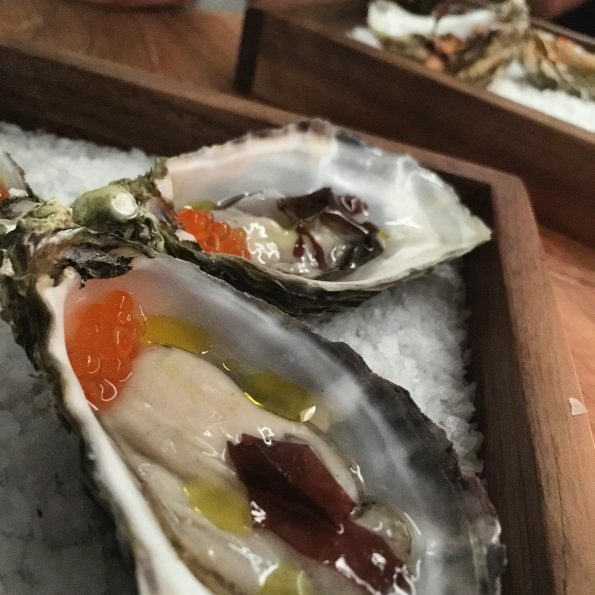 The evening menu is broken down into snacks, pickles, oysters, tartares, small plates (all oysters, tartares, and small plates priced €9.50), and sharing boards of either Irish charcuterie, Irish cheese, or a combination of both. When you open a restaurant and wine bar and call it after an iconic dish then that said dish has a lot to live up to. The tartare here certainly does that. Made using beef from the Dexter, this is one of only a few breeds of cattle left that are native to Ireland. Though much smaller than other breeds you shouldn’t be fooled by its diminutive size and with excellent marbling, packs in some amount of flavour and texture that works so well in this dish. 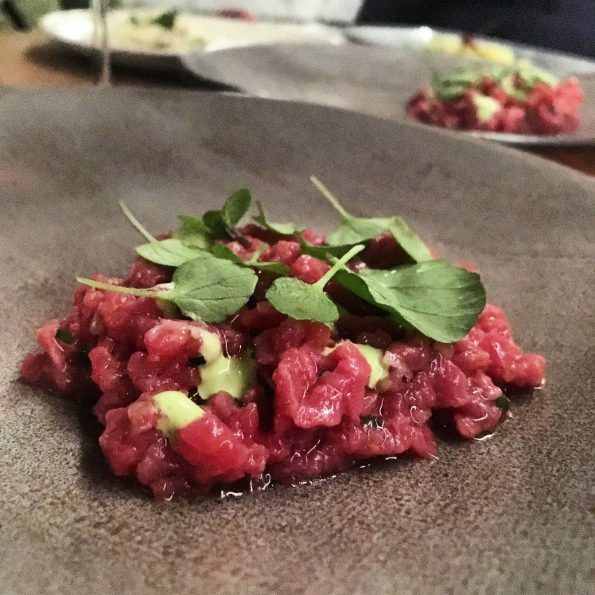 The thing about tartare (the dish) is that there is nowhere to hide and in a way is a statement of the quality of Irish produce, and in this case, beef. Served with pickled onion and parsley this was unanimously agreed at our table to have been the best we had tasted. High standards, highly achieved. Of course tartare can mean a representation of other raw food and another excellent example of Irish produce on display are the oysters, with Dooncastle, Kelly’s, and Flaggy Shore on offer here as a trio or individually (€9.50). All excellent though the Dooncastle with sea lettuce and trout roe is an umami packed highpoint for me. In terms of wine, the list is very strong and varied with some superb bottles on offer, all organic and natural. The Heinz W Joseph Grüner Veltliner priced at €41 per bottle is a fantastic accompaniment to the oysters with strong acidity and freshness to compliment the sea salty robustness. Two fabulous wines, the Roka from Slovenia (€39 per bottle) and the Montepulciano (€35 per bottle) are my picks of the reds. Staff are also more than willing to offer advice and assistance in recommending the varying options. 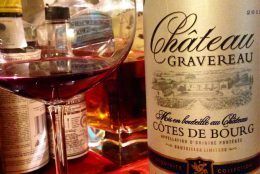 For a wine bar I would however like to see more wines by the glass and the opportunity to pair the extensive list with the different dishes. Perhaps this could be achieved by having wine specials every so often. Just a thought. There are many other small plates that hold their own with particular highlights coming in the form of the beef brisket with onions and fermented cream. The burnt cauliflower with sheep’s yoghurt is another example of hitting taste and indeed flavour notes with earthy pickled cauliflower and creamy yet acidic yoghurt delivering a balanced dish. Do they get everything right? The venison and barley stew, although using a grain that I am very fond of and delighted to see on a menu, comes out with a starchy viscosity that comes from the barley. A touch of stock to freshen the stew and give it a renewed vitality would have benefitted the dish. The pink fir apple potato plate, doesn’t quite do justice to this fantastic Irish potato by being undercooked but the flavour is there for a tasty plate of food. A couple of minor issues however from an overall strong menu that focuses on the quality of Irish produce. 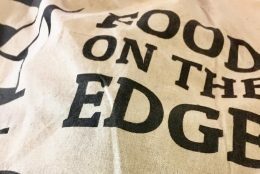 Lunch is a simpler yet no less flavour driven affair, serving sandwiches such as a corned beef, hegarty’s cheddar, and cabbage on a choice of sourdough, soda, or a gluten free option. Soup, a potato, leek and dilisk is very good and can be acquired along with a sandwich for a €10 lunch special. The cheese scone with fermented butter is also worth a try. The tartare and oysters are also available for lunch along with salads and most recently a stout and beef burger that has yet to be sampled. 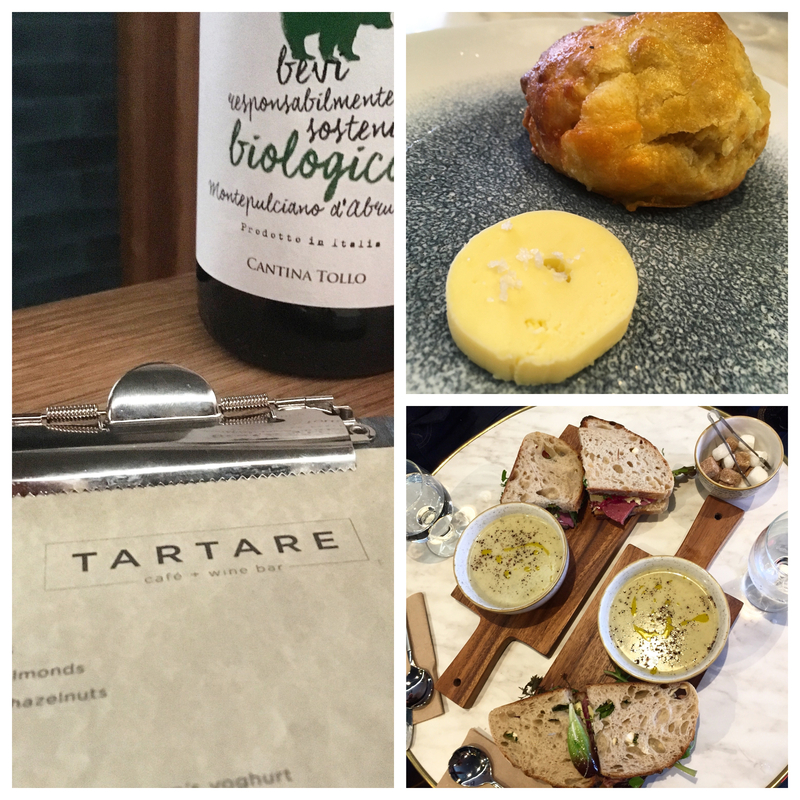 Tartare has just very recently (Sunday 4th February) launched a new Sunday brunch menu to add competition into an ever-growing market in the city. Though I haven’t tried it the menu reads well and can be found on their social media accounts. When you open up a third restaurant it must feel like you’re being compared on all sides to the others. I’m reminded of when you enter secondary school following in the footsteps of other siblings and the teacher says, “Oh you’re so and so’s brother/sister”, followed by pursed lips and a steely stare over nose reposed glasses. We all just want a chance to be judged in our own right and it’s no different here. Tartare is a very welcome addition to the city, offering an alternative evening dining and wine experience, along with a competitive option for lunch and Sunday brunch. This is terroir based cooking cultivated out of Aniar’s ethos of using seasonal Irish produce but to mistake this as some kind of Aniar lite version would be unfair as although clearly and heavily inspired by the culture from it’s bigger sibling this is a venue with it’s own identity. Credit to JP and Drigin for that accomplishment. Well worth the trip for the beef tartare and oysters alone. 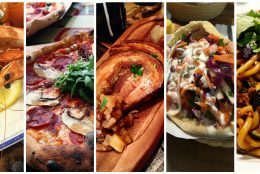 Hey Buddy!, I found this information for you: "Review: Tartare, Galway". 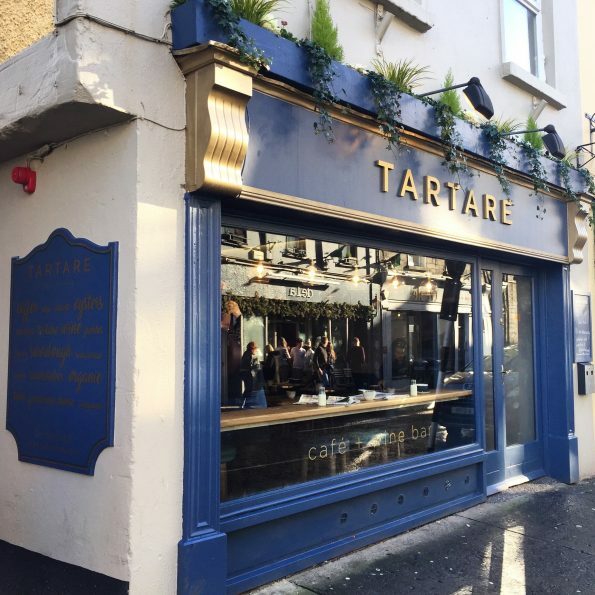 Here is the website link: http://www.aglassofredwine.com/2018/02/10/review-tartare-galway/. Thank you.